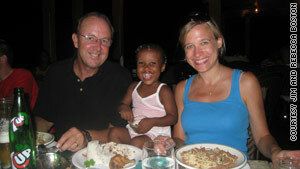 Jim and Rebecca Boston visited their daughter, Farica, in Haiti. They are anxious to bring her home. (CNN) -- If he could, Jim Boston would hop on a plane right now to bring his daughter, Farica, home. The 4-year-old Haitian girl has been part of his family since the day he and his wife, Rebecca, began the adoption process -- and multiple trips to visit her -- more than two years ago. She has the passport that will allow her to leave. She shares the Boston name with her parents and five siblings, including another Haitian girl. She was just weeks from leaving the Port-au-Prince orphanage where she's lived her whole short life. The only thing that was keeping her from flying off to Chicago, Illinois, with her parents: the visa to let her into the United States. And that was set to come by month's end. "We were two or three weeks away from going there to get her," Boston said Thursday. "We're so afraid. We expect rioting to happen soon. What little food they have is in jeopardy. ... We're trying to appeal for help in getting these children special status." Looking out for Farica in the interim, while adoption proceedings stand frozen, are two sisters from the Pittsburgh, Pennsylvania, area. Jaime and Ali McMutrie, 30 and 21 respectively, run one of the houses at the Brebis de Saint-Michel de L'Attalaye (BRESMA) orphanage in Port-au-Prince. In frantic messages they sent from a borrowed BlackBerry nearly 24 hours after the earthquake, the sisters shared the good news that all of the children in their care were alive. But they pleaded for urgent assistance. They and the children were living in the yard without food or water. They worried that babies would die from contaminated water. "I want to make sûre évryoné ùnderstands we cant stay inhaiti and thé kids will not live if théy stay," Jamie typed in a rush. Jamie's husband, Doug Heckman, said his wife and sister-in-law help oversee the care of 26 children, many of them little ones or those who've needed special care, including Farica Boston, who arrived sick when she came to the orphanage right after she was born. "They're very strong women, and they're very resourceful," said Heckman, 34, who's gotten used to the long-distance relationship he shares with his wife of four years. "The thing that freaks me out the most is that I know she is not going to leave these kids," even though as a U.S. citizen she could get out of Haiti. Jamie and Ali are "not going to abandon these children, even if it's life threatening. I can't imagine them leaving these kids, and if they did, I don't know what it would do to them." According to UNICEF, there were an estimated 380,000 orphans in Haiti in 2007, a number that's bound to change as the death toll from the earthquake rises. About 800 to 900 U.S. families are in the process of adopting children from Haiti, said Tom DiFilipo, president of the Joint Council on International Children's Services, an advocacy group for children in need of families. Of those, only about 30 kids are as far along in the process as Farica Boston, he said . Because documentation in Haiti may be buried beneath rubble, the organization Friday morning launched a database to collect information on where the adoption process of each family stands. Adoptive parents are encouraged to enter information in the registry on the JCICS Web site. A memo issued by the U.S. State Department on Thursday served as a reminder of how complicated helping children affected by natural disasters can be. While concerned Americans may offer to open their homes to suffering kids (beyond those already in orphanages), the department said determining who is truly orphaned -- and not just separated from family members -- can be a huge challenge. Likewise gathering the documentation needed to legally fulfill adoption requirements can be next to impossible. BRESMA, which is home to about 150 children, is one of the country's 67 crèches, orphanages that are licensed to perform adoptions, said Diana Boni, the Haiti and Liberia programs coordinator for Kentucky Adoption Services, who's worked with BRESMA for seven years. "We've been incredibly blessed. We have no fatalities and no serious injuries as of yesterday afternoon," Boni said Thursday. "Almost all of them have [adoptive] families. A lot of these kids under Haitian law are not Haitian. They're legally children of U.S. citizens ... and children are going to die because of bureaucratic paper delays." Grass-root efforts are under way to help. A Pittsburgh blogger, Virginia Montanez, is sharing updates on BRESMA on her blog, "That's Church." One Facebook page, "Let's Help Them Get Out of Haiti," encourages people to sign petitions to help the group. Lawmakers in Pennsylvania have reached out too, saying they're determined to help. Children are going to die because of bureaucratic paper delays. But while concerned citizens, families and adoption agencies try to make sense of what's going on and what's possible, false information and misunderstandings are circulating. Some parents spoke about a special meeting (not true) planned at the State Department on Friday morning to discuss their children. And at least one agency has been putting out word that 150 kids were going to be airlifted from BRESMA to Pittsburgh. "That's a very popular rumor," Boni said, hoping to put it to rest. "The State Department has issued zero visas since this earthquake." While the State Department does issue visas, DiFilipo of the Joint Council on International Children's Services reiterated that the Department of Homeland Security must approve the visas beforehand. He said he's been in touch with both departments. "We're not just working on kids with finalized adoptions. We're trying to find solutions for all those children," he said. "We don't want people to forget the most vulnerable children -- the orphaned." As officials work to find answers, Farica's parents must hold onto hope that their prayers will be answered and their family made whole. "I don't know if she understands. She's only 4," Boston said. "If I could talk to her I would tell her I love her and that I'm doing everything I can to get her home."